B Gopal and D Ghosh, Jawaharlal Nehru University, New Delhi, India © 2008 Elsevier B.V. All rights reserved. Wetlands are defined variously to include a wide spectrum of habitats where the land is inundated by shallow water or is saturated by surface or ground water at a frequency and duration every year that water becomes the primary factor controlling the environment and the associated plant and animal life. The soils that develop under the prolonged influence of waterlogging or submergence are known as hydric soils, and the plants that are adapted to or require such hydrological condi tions are called 'hydrophytes'. The vast majority of wetlands are characterized by the presence of vegetation comprising of macroalgae, mosses, or herbaceous or woody vascular plants. However, habitats such as gravel beaches and rocky shores without hydric soils and vege tation are also wetlands as defined by the Ramsar Convention as well as the United States Fish and Wildlife Service. Wetlands occur in all climatic zones on the Earth from tundras to the tropics, and include bogs, fens, marshes, swamps, springs, lagoons, mangroves, shallow lakes, and temporary water bodies such as playas, potholes, sebkhas, dambos, chotts, chaurs, and billabongs. Riverine flood plains generally comprise a mosaic of habitats varying from swamps, marshes, and shallow water bodies (oxbows) to water saturated lands that lie along the river channels and are periodically flooded by the river. The beds of marine algae (kelps) and sea grasses in shallow coastal seas as well as the coral reefs are also considered as wet lands. Besides these natural wetlands, there are a large variety of man made wetlands such as fish ponds, paddy fields, and shallow reservoirs. For simplicity, wetlands can be grouped into four major types which are distinguished by, and lie along the gradients of, hydrological regimes, nutrient status, and salinity that in turn also determine the dominant vegetation type (Figure 1). Bogs are typically ombrotrophic, acidic, and domi nated by Sphagnum mosses. They are deficient in nutrients because of their dependence entirely upon the precipitation. Low temperature and acidic conditions result in extremely slow decomposition, and hence the accumulation of partly decomposed organic matter - the peat. Fens are also peat accumulating wetlands in similar environments but receive water and nutrients from the surrounding areas. Fens reflect the chemistry of the geo logical formations through which these waters flow. 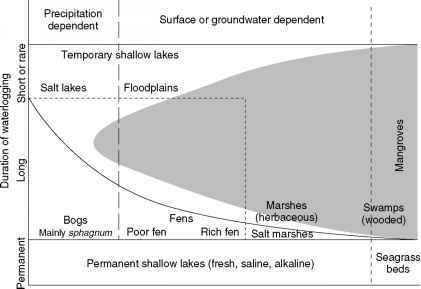 In limestone areas the water is high in calcium carbonate resulting in fens that are typically buffered to a near neutral pH of 7. However, the level of calcium or magne sium bicarbonate varies widely in fens. At low levels of bicarbonate the pH may be closer to pH 4.6 resulting in an acid fen. At very high levels of bicarbonate, the water may reach a pH of 9. Accordingly, fens differ also in their plant and animal communities. Bogs and fens occur in similar climatic and physiographic regions, and often side by side, one grading into the other. Marshes (including salt marshes) are herbaceous wetlands, mostly on mineral soils with variable supply of nutrients, and develop under a wide range of hydrological regimes. Swamps are dominated by woody vegetation (trees and shrubs), and are often referred to as forested wetlands or wetland forests. Common examples are the vast floodplain forests of the Amazon river basin, the bottomland forests and Taxodium swamps of southern and southeastern USA, and the riverine swamps in Asia and Australia. Some tropical swamps, such as those in Southeast Asia, also accumulate peat. The papyrus swamps in Africa are in fact marshes dominated by the giant sedge, Cyperus papyrus. Mangroves are forested wetlands restricted to tropical and subtropical regions in estuarine deltas. Shallow water bodies and lagoons and also the shallow water coastal wetlands are generally dominated by sub merged herbaceous vegetation. resources (for food, fuel, and fiber). In many regions of the world, wetlands formed an integral part of the sociocul tural ethos of the human communities. Papyrus was used to make yachts and paper, reeds were very widely used for housing and thatch, and many plants and animals served as food. Today, half the human population depends for subsistence on two major wetland produce -rice and fish. Yet, the wetlands were for long treated as wastelands (typically by the western world) that were drained, filled, and reclaimed or converted to other land uses. However, during the past 50 years, human percep tions have changed gradually: first recognizing their importance as habitats for numerous kinds of waterfowl and later as 'liquid assets' or 'waterlogged wealth'. Wetlands are now recognized as ecosystems that perform many ecological functions and provide a variety of valuable goods and services. Among them, different wetlands help in groundwater recharge or flood abatement, provide habitats to a large diversity of organisms representing all groups from microorganisms to mammals, enhance the esthetics of the landscape, and above all perform several important biogeo chemical functions for which they are known as the kidneys of the Earth and also as the agents of climate change (methane emission). Wetlands, other than the bogs, are highly productive systems, with their productivity being generally greater than in adjacent terrestrial systems under similar climatic conditions. Several wetland plants such as Phragmites australis, Arundo donax, Cyperus papyrus, and Eichhornia crassipes often attain a standing crop of more than 10 000gm , whereas the net annual production ranges from 1.5 to 2.0 times more than the standing crops. Floodplains and littoral marshes are important grazing lands for many large herbivores including domestic cattle and water buffaloes. Wetlands support very high biodiver sity, disproportionate to their area on a global scale. The inland wetlands are estimated to account for about 15% of the Earth's total biodiversity, and may include up to 30% of the total biodiversity of some countries. A significantly large proportion of animal species (particularly insects, amphi bians, and reptiles) depends upon the wetlands at some stage of their life cycle, and thousands of animals, especially the waterfowl, annually migrate between wetlands in differ ent continents. Also, a fairly large proportion of wetland fauna are rare, endangered, or threatened. In recognition of their importance for biodiversity, and especially as habitats for the waterfowl, wetlands are the only ecosystem which became the subject of an international convention, the Ramsar Convention, as early as 1971. Among various functions and ecosystem services, the wetlands are most valued for their biogeochemical func tion that results in the improvement of water quality. By virtue of their location, the wetlands receive nutrients and a variety of pollutants with the storm water, agricultural runoff, and other overland or subsurface flows that invari ably pass through them from upland areas before entering the open waters. Natural wetlands receive nutrients also from the open waters (rivers, lakes, seas) during periodic flooding. Wetlands retain and/or remove these nutrients and pollutants from the inflowing water through a multi tude of processes, thereby improving the quality of the water flowing out of the wetland or infiltrating into the ground water (Table 1). wastewaters through the production of phenolic metabo lites, though other processes are also involved. During the past two decades, increasingly greater attention has been paid to the wetlands for their potential for improving water quality, and for the development of an energy efficient inexpensive technology for waste water treatment based on wetlands. Within the United States, natural wetlands have received much protection because of the recognition of their water quality improvement function by the Clean Water Act. This important function, which is now being exploited for ecological engineering, is described below in some detail. Nutrients and other pollutants in the wastewater passing through the wetland undergo transformations along sev eral pathways involving physical, chemical, and biological processes. The major physical process is the settling of suspended particulate matter. The settling process depends upon, besides the nature and size of the particles, the residence time of inflowing wastewater within the wetland and the physical resistance offered by the vegeta tion to flow velocity. The reduction in suspended particulates, particularly the organic matter, results in an increase in transparency (lowered turbidity) and a major reduction in the biological oxygen demand (BOD). The chemical processes include adsorption, chelation and pre cipitation, and reduction and oxidation. Among the biological processes, most important are those mediated by microorganisms which decompose the dissolved and particulate organic matter and also contribute to the oxi dation and reduction of C, N, and S depending upon the redox potential. Generally, the reduction reactions dom inate under anoxic conditions in the presence of high organic matter load. Interactions between these processes and biota are quite complex and involve mediation by several elements such as Fe, Al, Mn, and Ca. Among various pollutants, N and P are of greatest importance because they cause eutrophication and are not effectively removed by conventional secondary treatment. The removal of these nutrients from wastewaters has there fore received greater attention in wetland systems. The total P content in wastewaters comprises inorganic and organic, particulate and dissolved nonreactive forms, such as colloidal P complexes, polyphosphates, nucleic acids, sugar phosphates, aminophosphonic acids, and organic condensed phosphates. In the wetland sub strates, major pools of inorganic P include loosely adsorbed P, and hydrous sesquioxides, amorphous and crystalline aluminum and iron compounds in acidic, noncalcareous soils and calcium compounds in alkaline calcareous substrates. The loosely adsorbed P is important for plant growth and controls the P concen tration of the overlying water column. The P associated with oxyhydroxides is readily desorbed under most conditions, but the P associated with crystalline iron and aluminum is desorbed only under prolonged anoxic conditions. The calcium and magnesium forms of P are generally unavailable for biological assimilation under natural conditions and are not common at low pH conditions. However, under anoxic conditions, the sedi ment pH is mostly neutral to alkaline and calcium and magnesium forms of P are often dominant. Transformations between these various forms occur continuously to maintain equilibrium. The organic P fraction, primarily comprising phospholipids, inositols, fulvic acids, and humic acids, is generally biologically reactive and can be hydrolyzed to bioavailable forms. Organic P is mineralized by alternate wetting and dry ing cycles, changes in substrate pH, and increased microbial activity. Phosphorus removal from wastewaters entering a wetland occurs through several pathways, namely (1) from water column to the sediment; (2) adsorption on to the organic or mineral sediments; (3) co precipitation with carbonates dur ing photosynthesis (generally at Ca concentrations of >100 m gl 1 and pH>8.0); and (4) uptake by macrophytes (from the water column or the substrate), algae and epi phytes, and incorporation by microorganisms (Figure 2). Phosphorus is readily adsorbed on to the colloidal particulates, both inorganic and organic. The amount adsorbed by the wetland substrate is determined by its physico chemical characteristics (texture, the abundance of aluminum, iron and calcium, and surface area) besides the P concentration in the water column. Organic soils such as peat also facilitate adsorption. 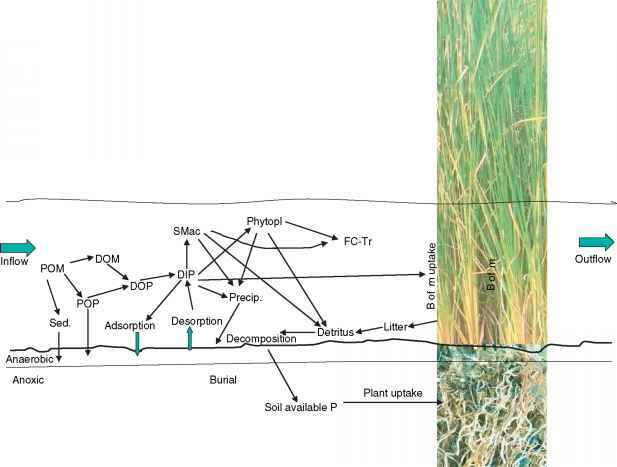 Figure 2 Major processes and pathways of phosphorus transformation in wetlands. DIP, dissolved inorganic phosphorus; DOM, dissolved organic matter; DOP, dissolved organic phosphorus; FC-Tr, food chain transfer; Phytopl, Phytoplankton; POM, particulate organic matter; POP, particulate in organic phosphorus; Precip., precipitation; Sed., sedimentation; SMac, submerged macrophytes. Two larger arrows represent adsorption and desorption under changing redox conditions. Physical settlement of particulate P and other particulate matter with adsorbed P is an important mechanism of nutrient removal. Increased phosphorus loading enhances biomass production and hence peat accretion which in turn provides effective storage of P for extended periods. In alkaline waters, P is co precipitated with calcium car bonate during photosynthesis by submerged plants and algae, and settles on the sediments. P release from the substrate but mass balance studies show that substantial P is released from sediments to well aerated waters that are weakly buffered and have a low pH and low P concentration waters. called as nutrient pumps. In case ofperennial plants such as reeds and cattails, a part of the nutrients is translocated back to the roots and rhizomes before the death of above ground shoots, and these nutrients are utilized for the early growth in the next growing season before fresh uptake occurs. These processes therefore limit the potential removal of P by the wetland plants. Total N in wastewaters occurs in both organic and inor ganic forms. Whereas the organic N may be dissolved or particulate, the inorganic N is either in form of nitrates or ammonium ions. Same forms of nitrogen occur also in the wetland substrates. 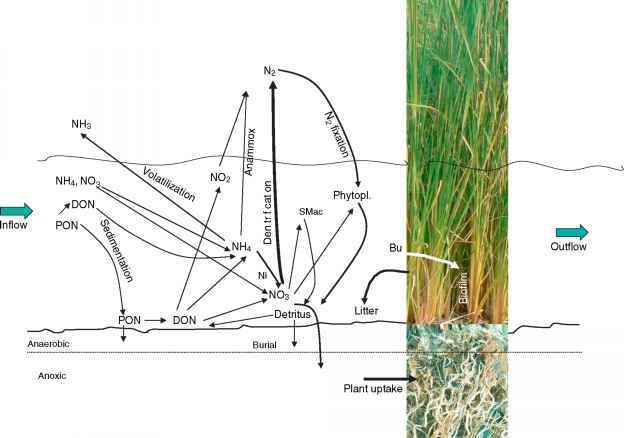 The nitrogen undergoes transformation along several pathways that govern its retention or cycling within and release from the wetland (Figure 3). Unlike P, adsorption plays a minor role in case of N because only ammonium ions (NH^) are weakly bound to soil particles. Dissolved forms of N may however move across sediment-water interface through diffusion along the concentration gradient. Settlement of suspended organic particulates on the wetland sediments can remove large amounts of nitrogen. Further amounts of nitrogen can accumulate in the wetland in the form of partially decomposed plant detritus (peat) and gradually buried and incorporated into the soil profile. Figure 3 Major processes and pathways of nitrogen transformation in wetlands. Bu, biofilm uptake; DON, dissolved organic nitrogen; PON, particulate organic nitrogen; SMac, submerged macrophytes; Ni, nitrification; Phytopl, phytoplankton. the total uptake ofnitrogen depends upon the growth rates and maximum biomass attained by different species (Table 2) as well as the availability of nitrogen in the water (Tables 3a and 3b). The wetland plants with large proportion of structural tissues generally account for lesser amounts of nitrogen assimilation. Several studies show that whereas the nitrogen removal by plants may account for only 12-14% of the total loading in wastewater, the actual removal by the entire system through various other pro cesses is much higher and may go up to 95% in some cases.